Eye On Tampa Bay: Will the PSTA Board Continue its wayward Path? Wednesday the reconsideration of the vote to elect Darden Rice as PSTA is the first item on the PSTA Board Agenda. The reconsideration vote resulted from a violation of the Florida Sunshine laws as Ms Rice and Ms. Johnson discussed the election prior to the actual vote. Then from Mike Ferrier and Mike Deeson at 10 News:10 Investigates Sunshine Law violation at PSTA. The PSTA Board and the CEO Brad Miller have a very checkered past and electing a Board Chairperson under the cloud of a Sunshine law violation would be a big mistake. Every decision the Board Makes will come under question and could be subject to a legal challenge based on the Rice's appropriateness to serve as Board Chairperson. This whole issue is not about Darden Rice's ability to do a good job or provide leadership; it is all about restoring trust in the PSTA Board. Rice has been involved with Bay area transportation and the PSTA for many years and often expresses the need for confidence in the PSTA Board. The real question on the table is: is Darden Rice serious about the need for effective leadership at PSTA or is she more concerned about adding another high profile listing on her political resume? There are already those making noises about legal action if the Board confirms Rice as Chairperson. 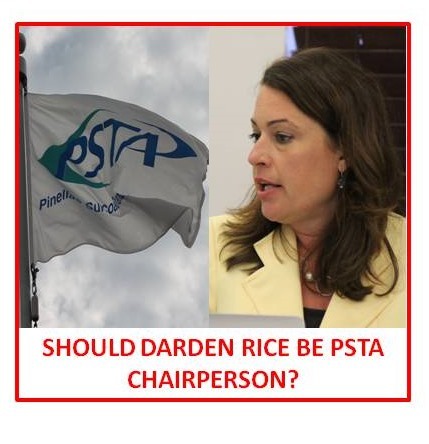 Darden should spare the PSTA Board the angst of not confirming her election as Chairperson. She should simply withdraw and let the PSTA Board elect someone else as chair. If she chooses not to withdraw her name from consideration, the PSTA Board should protect the taxpayer's interest and the PSTA Board's integrity and not confirm her nomination. This is a real test of character vs ego. From the Board's perspective, this is not about getting their backs up and showing us they can do what they please. It is all about making sure the PSTA governing body can function free of controversy and challenge.